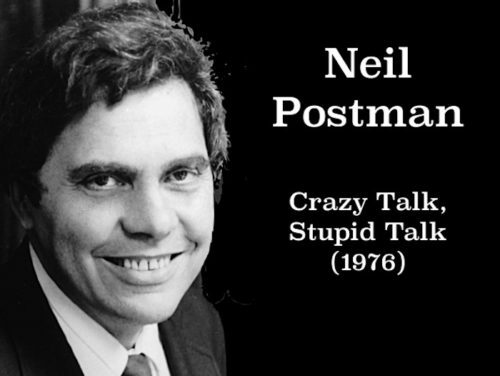 The Context of White Supremacy hosts the debut study session on Neil Postman’s Crazy Talk, Stupid Talk: How We Defeat Ourselves by the Way We Talk And What to Do About It. Postman is a Racist Suspect, who authored a number of notable texts, including: Amusing Ourselves To Death; Teaching as a Subversive Activity; and How to Watch TV News. A prolific author, Postman published 18 books, was a professor of media ecology at New York University, and delivered insightful critiques of technology and the use of language. Students of counter-racism understand the primary weapon of Racists is the incorrect and deceptive use of words. We’ll keep this in mind while studying Crazy Talk, Stupid Talk. This book, published in 1976, groups problematic speech into two groups. He defines “stupid talk” as incorrect language use that promotes confusion and incoherence. “Crazy talk” is identified as language that may be correctly structured, but promotes incorrect thinking. Postman identifies certain types of Racist speech as “crazy talk.” This book, written by a White man does explicitly mention Racism often; listeners should be alert. Postman also provides an array of constructive insight about the way we use words. A crucial aspect of counter-racism involves refine our use of words as tools.